The Psalms were originally the text of the ancient Israelite temple services. Their poetry was woven into a magnificent eight day pageant-like temple drama that depicted the full eternal sweep of the Savior’s mission and his Atonement. The principles taught in that drama were accurately preserved on the brass plates and taught by Nephite prophets throughout the Book of Mormon. Soon after Lehi and his family left Jerusalem, the city and its temple were destroyed and the Jews were taken captive into Babylon. While there, they modified their religion in order to fit their new situation. But in doing so, they lost much that was most important. Even after their return from the Babylonian captivity, the Jews did not restore their original ancient temple worship. The order of the Psalms was rearranged so they no longer could be read from first to last to learn the story they once told. Consequently, in the Savior’s time the temple at Jerusalem was not used in the same way as the Temple of Solomon. However, neither the story told in the ancient drama nor its teachings were entirely lost. Some of the people recognized them in the teachings of John the Baptist and the Savior, and the authors of the New Testament frequently quoted the Psalms to remind their readers that the ancient fathers once understood the Savior’s mission and Atonement. LeGrand Baker and Stephen Ricks have made their book “Who Shall Ascend into the Hill of the Lord? The Psalms in Israel’s Temple Worship in the Old Testament and in the Book of Mormon” free for all. You can access a PDF of their book here. This entry was posted in Kingship, Old Testament, Psalms, temples and tagged Israel, LeGrand Baker, Psalms, Stephen Ricks, Temple Worship. Bookmark the permalink. 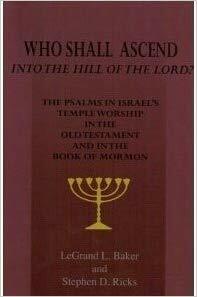 1 Response to Who Shall Ascend into the Hill of the Lord?